We’ve all been there. It’s time to clean your Bausch and Lomb contact lenses but your solution is empty. You’re desperate for an alternative, maybe at work where you’re not able to run out and get a new bottle. You might feel tempted to use plain water. The main offender is tap water is the microorganism. These microorganisms can cause serious eye problems, with one linked to blindness. The amoeba in question has been found all over common water sources like pools, lakes, rivers and even cases for contact lenses. Just because it’s filtered and acceptable for drinking doesn’t mean it will work on your contact lenses. Microorganisms are still present in filtered or bottled water. They won’t harm your body, but they aren’t good for your lenses. If you happen to have used water, you should be aware that there are dangerous parasites that may have been caught beneath your lenses. This can lead to eye-threatening infections. Although these infections are treatable, it’s ideal not to get them in the first place. 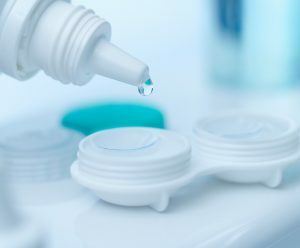 Contact lens solution is designed to both clean and sanitize your eyes. It’s ideal for helping your lenses keep their shape as well. Contact lenses that have been submerged in water may feel like they stick to the eyes when applied. They will feel uncomfortable and may cause your vision to appear blurry. Soft lenses are made using water and other materials. Using water as a storage or cleaning solution can either dry them out or completely change their shape. Even minor changes would irritate the eyes or make clear vision impossible. There’s a small difference in lens cleaning solutions between multipurpose and hydrogen peroxide-based solutions. Multipurpose is the most frequently recommended kind of solution for lenses and the reason is simple: they do more than clean or store. Hydrogen peroxide is great for those with allergies, but most users will find multipurpose solutions to offer more than enough disinfectant power. Use this simple procedure to clean your lenses each day with multipurpose solution and never use water.